We just got this off some third rate interim council lawyer, presumably just out of college? You have recently published an extract from a report to Bristol City Council’s Cabinet concerning AVTM/Metrobus. The part of the report you have published is not for publication by virtue of paragraph of Schedule 12A of the Local Government Act 1972 (as amended by the Local Government (Access to Information) (Variation) Order 2006). This is because the information contained therein is information relating to the financial or business affairs of a particular person (including the authority holding the information) ie it is commercially sensitive information relating to the value of a contract yet to be awarded. In the circumstances, publication of this information seriously jeopardises the project and the Council’s ability to deal with this matter in the best interests of the people of Bristol. You are therefore required to remove this document immediately. Failure to do so may necessitate the Council in having to take further legal proceedings. To confirm, once the contract has been awarded then information that will assist the public in understanding the decision making process, will be published. I do hope that you can understand why this information should not be in the public domain at this particular time and will assist us by removing it immediately. Please confirm by return that you will be doing this. Could you confirm on what basis you will be taking your “further legal proceedings” please? Obviously it is not by virtue of paragraph of Schedule 12A of the Local Government Act 1972 (as amended by the Local Government (Access to Information) (Variation) Order 2006) since this is NOT a gagging or confidentiality clause and it does not prohibit us disclosing information in the way you appear to be claiming. Schedule 12A of the Local Government Act 1972 (as amended by the Local Government (Access to Information) (Variation) Order 2006) is an exemption clause that simply allows the authority not to disclose the information as required under Part VA of the LGA 1972. What’s that to do with us? And, er, here’s the dickhead lawyer not understanding how to use email and admitting he has to get his boss to write his letters for him! Shahzia-Could you draft a response for me to send please. I suspect it won’t make an iota of difference unless we can identify the perpetrators and take them to court. After further research it appears that Sanjay Prashar is the Service Director (and monitoring officer!) for Bristol City Council Legal Services and therefore the unfortunate Shahzia Daya’s boss. Yes, this is the oaf now in charge who replaces Liam “Malfoy” Nevin. Perhaps he should focus a little more on making sure the council’s delegated planning decisions are constitutional and a little less time making a fool of himself with crap threats? This entry was posted in In The Courts, News and tagged Bristol City Council, BRT, Cabinet, Leak, Metrobus, Sanjay Prashar, Schedule 12A of the Local Government Act 1972, Shahzia Daya on November 5, 2014 by thebristolblogger. LEAKED DOCUMENT!!! WHAT THEY DON’T WANT YOU TO KNOW ABOUT BRT! We’ve been LABOURing over this cabinet report LEAK about the financial black hole emerging in the city’s white elephant BRT bus project. The report that we’re publishing and which has no council managers’ name anywhere near it to take ownership and responsibility for the shambles, lists a series of overspends due to the inflated FINANCIAL DEMANDS of corporate civil engineering firms for work on the Ashton Vale – Temple Meads bus route. 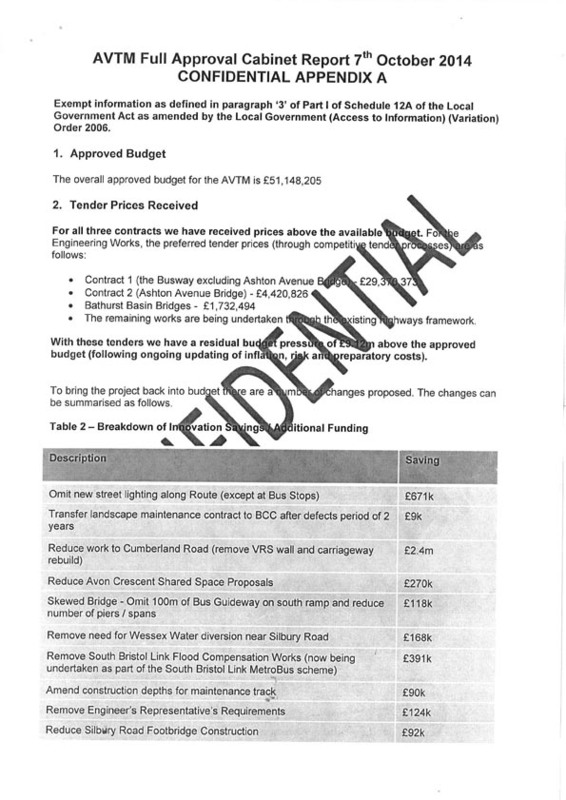 So far, before any work has even begun, costs for works on the Ashton Avenue Bridge; bridges at the Bathurst Basin due to Fergo’s rerouting plans and on the so-called “Cumberland Busway” (Cumberland Road to me and you) amount to £9.12m MORE than was originally budgeted for. The council’s proposals for covering these losses are equally interesting. One plan is to shave £2.4m off the budget by a REDUCING FLOOD DEFENCE measures along the New Cut on Cumberland Road. Another is to TARGET PEDESTRIANS and not bother with street lighting, except at bus stops, over the whole route. Another is to inexplicably “reduce the cost of city centre work” for the BRT scheme by £1.1m. Yet more corners cut then. Another is to simply reallocate £1.5m to “OTHER SCHEMES”, which is likely to be transport budgets – so don’t expect any new pedestrian crossings any time soon in your community. Yet another is to “reallocate” £0.4m from the CYCLING AMBITION FUND and spend it on the Bathurst Basin bridges. In other words money for cycling will be spent on buses! A further £1.1m will be absorbed by “ADDITIONAL FUNDING”, whatever that is. Is all this legal? Council budgets raided and tax payers money diverted – in secret – to corporations on the authority of unsigned confidential council cabinet reports? This entry was posted in Diggers & Dumpers, News, Road & Rail and tagged Balfour Beatty, Bristol City Council, BRT, Cycling Ambition Fund, Leak, Metrobus, Overspend on October 31, 2014 by thebristolblogger.